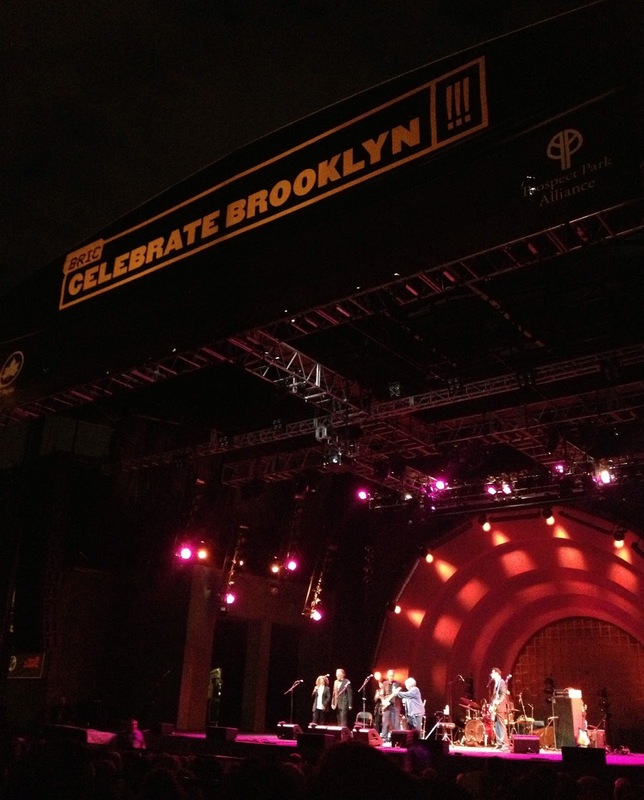 While I was at Barclays with the Postal Service last night, Dry Paint Signs' frequent photographer, Carrie Soom, went to Prospect Park to celebrate Brooklyn with Cody Chesnutt and Mavis Staples. I ganked her camera for my show, but she was able to snap a few iPhone pics and provide me with enough material to write a review. Having just watched Cody Chesnutt give an unforgettable performance at SOB's the previous night, it was intriguing to see how he would translate his act to a much larger venue. As it turned out, it was very similar. Towards the end of "Everybody's Brother," Cody instigated, "The clouds have parted. It's time to celebrate, and I can't think of a better way to celebrate than singing together in a communal way." He led the crowd on a "not turning back" singalong, which was extended while the sound crew fixed a tech issue with the drums. Cody even found a way to make it into the audience, hopping offstage and over the barrier to dance with an elderly woman during "Do Better to the Young." Do better to the old as well. While Carrie preferred the intimacy of SOB's, the addition of a saxophonist and trumpeter was a real treat, bringing a whole new level to "Love is More Than a Wedding Day" and a round of solos during "What Kind of Cool." "Brooklyn is like a second home to me," Chesnutt admitted. You're welcome back anytime you please. Carrie and I caught the tail end of Mavis Staples' set at Beale St. Music Festival last month, so she was excited to see a full show from the queen of contralto. Despite the fact that she has a new album coming out in two weeks, Staples kept the setlist fairly standard, getting two new tunes out of the way early to make room for some Staples Singers' classics. "We have come this evening to bring you some joy, happiness, inspiration, and positive vibrations. Enough to last for the next... hmm... six months," Mavis offered, a possible clue that she'll return to NYC at the end of the year. Which is good, considering knee pain almost stopped her from making it yesterday. "I'll tell you, ol' devil, the devil is always busy. He tried to keep us from coming to Brooklyn. He starts messing with my knee. I said, 'Satan, get back! I'm going to see my friends in Brooklyn!'" Mavis said, eliciting cheers from the Brooklynites before dropping into "The Weight." Following "Creep Along Moses," she revealed, "I came out here to have a good time, and thanks to y'all, I'm doing just that." The set ended like it did in Memphis, with Mavis riling up the crowd for "I'll Take You There." "We're gonna take you way on back. 1970!" she yelled before pointing at someone in the crowd. "You weren't even born!" In the midst of the song, Mavis demanded, "Brooklyn, can I hear you?" "Woo!" cheered the crowd. "Donny?" said Mavis, turning to backup vocalist Donny Gerrard. "Sounds like Yonkers to me," he egged on. "Booooooo!" bellowed Brooklyn. "Oh, Donny, I think you hurt somebody," said Mavis with a laugh. If the staggering amount of embarrassing mom-dancing was any indication, Staples took everyone there. Her new LP, One True Vine, drops on June 25th.